For nearly 50 years, adventure travelers have relied upon Engel to keep things cold when they're on the move. Engel fridge/freezers are fully adjustable; perfect for keeping food and other items cold – or frozen. You control the level of refrigeration you require. If you have a food box full of sandwich meats, vegetables and beverages, a temperature of around 38º F is just perfect. For frozen foods, even ice cream, just crank up the dial and your Engel will respond without hesitation. 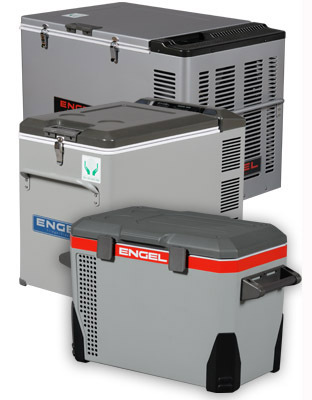 Engel fridge/freezers operate on 12V or 24V DC battery power, or on 110V AC power. In fact, they're smart enough to know the difference and will automatically switch back and forth – a big plus for sailors and boaters who often switch from battery power to shore power. It's also handy for travelers who use battery power when they're on the road, but want to plug in their Engel when they get back home. Ask anyone who relies on battery power for extended periods of time and they'll start talking about power draw, amps per hour and efficiency. Here's where the Engel swing motor compressor really shines. The swing motor does not demand a huge power draw at start-up, like traditional compressor motors. Depending upon the model, Engel fridge/freezers draw between 0.5 Amps and 3.6 Amps per hour. Typically, when maintaining temperature, the nominal draw of any Engel is under 1 Amp per hour. The Engel MHD13F-DM is designed to meet the needs of the EMS market for the transport of temperature-sensitive medications or having frigid saline solution available for induced hypothermia. The proven Engel Swing Motor compressor and exclusive digital thermostat maintain precise control of temperature, anywhere from zero- to 113-degrees F.
This model is designed to operate in ambient temperatures betweenn 14 ～113°F. Internal Dimensions : 13.75" x 7.5" x 7.5"
External Dimensions : 17.5" x 11.3" x 14.5"
20.1 "x 14.9" x 16.7"
11.5" x 8" x 10"
15.3" x 9.8" x 12.4"
13.5" x 7.8" x 12.4"